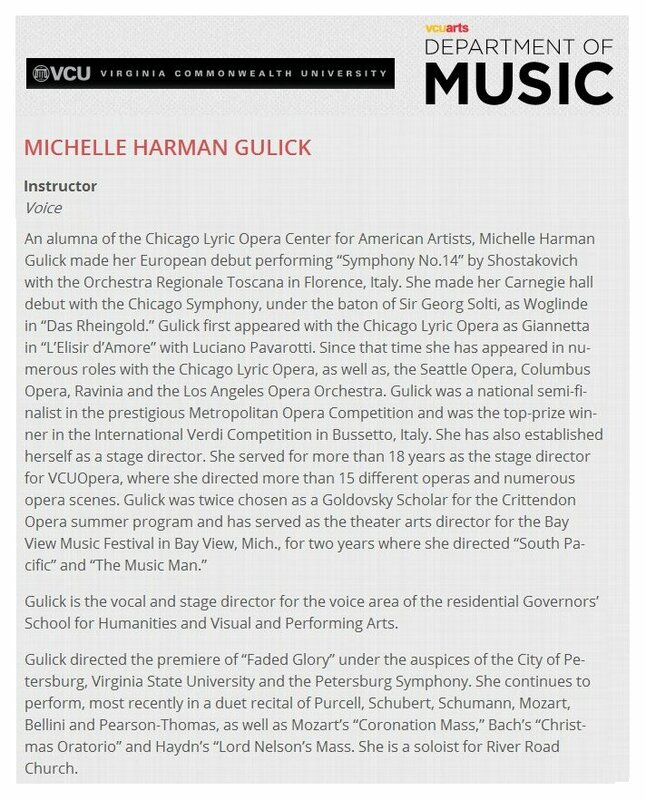 Michelle Harman Gulick Interview with Bruce Duffie . . . . . .
We met in November of 1982, while she was part of the apprentice program of Lyric Opera of Chicago. 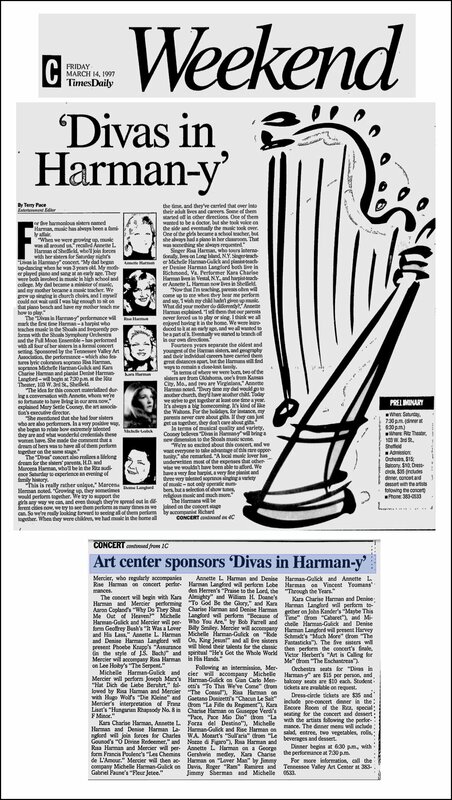 This meant she was gaining much experience by working along-side of world-class singers and conductors and directors, and being able to sing for audiences and critics on the main stage in significant productions. Despite being so very early in her career, she showed a great deal of maturity and awareness of the problems and rewards of being an opera singer. Portions of this interview were published in Opera Scene in May of 1983. Now the text has been slightly re-edited and is posted complete on this webpage. As this is being prepared for the website presentation early in 2016, she has had a fine career and is teaching at Virginia Commonwealth University. So this conversation is a snapshot showing her views and ideas at the onset of that career. Here is what was said that afternoon at the apartment of Michelle Harman Gulick . . . . . . .
Bruce Duffie: You are very fortunate to be able to have an opera career and a nice apartment where you actually come home each night, with a husband, plants, stereo, everything. Most singers are so very transient being six weeks here and a few days there, constantly living out of a suitcase. Michelle Harman Gulick: In my case, because of the program I’m in at the Lyric, it gave me the opportunity to have a base. I’m here for ten months and I can establish a home. BD: Will you miss that? MHG: I think we’re going to stay here and at least keep our base here because we’ve found we really like it. It’s closer to things going on in the opera world than where we came from in Virginia, but I’m not crazy about moving to New York immediately and getting into all that rat-race now. I’ve visited there, and there are disadvantages to not being there, but in the long run for my own peace of mind, I think Chicago is much better. BD: My wife enjoys the tea, but I’m a milkaholic. MHG: I am too. I could do a commercial. BD: Would you ever do a commercial? MHG: I guess if it were for something I really believed in. BD: It wouldn’t compromise your operatic career to be on the tube for 30 seconds every half hour? MHG: I’m not in that position yet where it would compromise anything. BD: [To Dave] Are you supportive of your wife’s career? Dave: Sure. I’m an organist and have a church job in Westchester. BD: Do you accompany her much? Dave: Not too much. I don’t play orchestral reductions well. I’m really more into sacred literature for organ rather than piano. So we fight every time I play for her. MHG: One summer he played for me, but now it is only if I need it occasionally. BD: Are you too close to him to make it work? MHG: It’s just because our musical opinions differ, and because we’re so close we can get away with not being so polite. BD: Do you go to her performances? BD: Do you tell her what you think of them? Dave: I’m usually pretty honest whether she wants to hear it or not. MHG: He’s naturally more critical of me than of anybody else’s performances, and that can be frustrating. Dave: I hear the little things because I’ve heard her more. BD: And I assume he’s more concerned about you than anyone else in the cast! MHG: Yes, that would be the case. BD: Having this as your home base, will you now travel around and accept engagements elsewhere? MHG: Yes. I enjoy traveling, so it won’t bother me too much. I hope that in the future, Dave can go with me. Right now we can’t manage that financially. I prefer it when he’s there to help out, especially in a new place. I’m a bit spoiled. BD: You have him take care of the meaningless details that become so very meaningful? BD: If you were offered a contract for a year in Graz or Palermo, would you accept it? MHG: It all depends on what the contract entails. In a lot of the German houses you have to sing everything, and my particular voice could not handle that. It would simply do more damage than good for me. BD: You’ve just won the Met Regional auditions. Is that the kind of thing that can be a big boost to your career? MHG: It’s very helpful. It’s not the same as it used to be when they just choose one person and offer that person a contract with the Met. So there’s not the prestige that you’re the number one winner and will definitely sing there. But financially it is very good. Also you get a chance to coach with important people and be heard by important people. And some people are impressed that you are a Met finalist. BD: When you’re singing, do you worry about doing your best, or do you simply want people to like you no matter what? MHG: Both. Some people don’t care what the audience thinks as long as they feel they did well. But I care about what the people think. BD: Are you conscious of the people in the house? MHG: Oh yes, I am. BD: Does it bother you when they rattle program or use their little flashlights? MHG: When that happens I’m not doing something right. If I’m presenting the opera the way it should be done, the audience is not going to rustle and play and fidget. There will always be some of that, but you can tell if there’s more than there should be. BD: Do you feel the communication coming back from the audience? MHG: Hopefully. It doesn’t always happen, but hopefully it comes. You can feel it if the audience is really with you. It’s a vibration or osmosis or something. BD: Does that improve your performance? MHG: I think so. If you know that the audience is really with you, that makes you want to give even more. BD: Can you ever give too much? MHG: I’ve heard that you can, but if you go a little overboard, OK. I just think I should give as much as I’ve got. BD: You’ve sung in different sized houses. How does the size of this house [3600 people] affect vocal production? MHG: It shouldn’t really affect the production, but it does. There are rooms which are so cavernous that you sing and sing and sing and it’s like it will never end. You have to project a little more and focus the voice better in houses that are bigger or houses where the acoustics are poor. BD: I ask because Lyric is such a big house. MHG: But it’s a very nice house acoustically to sing in. It’s not the ‘livest’ thing around, but you can sing softly and it carries. Surprisingly, the little Civic [the smaller theater next door which seats 900] is much worse than the bigger house. BD: Can you scale your voice to meet the requirements of a smaller house now that you’ve done so many things in the big house? MHG: One of the comments I’ve gotten from agents that I’ve sung for is that it’s obvious that I’ve sung in a big house. When you sing in the big house, you project to the largest degree. In a smaller house, that comes across with a little bit of metal in the voice, and that can be irritating to some people, whereas in the big house, you need that definition to make the voice carry. So in a small house, you can focus too much. You still want to project, but it’s different in different houses. BD: How much do you get wrapped up in the performance, and how much does the conductor waving the stick bother you? And does the prompter help or distract? MHG: In the Butterfly I’m really more involved with the people I’m onstage with. I’m aware of the conductor, but I just catch him out of the corner of my eye. But this is a very small role. In a bigger part it would be different. Ariadne was different because it’s a different kind of opera, much more an ensemble that has to be controlled by one person, namely the conductor. Maestro Janowski demanded a different kind of attention to him, so I was more aware of him and the other technical things in that opera. Ideally you want everything to fit together — conductor, stage designer, characters, everything with everybody working to make this the most wonderful thing. That happens very rarely, but we try for it. I like the idea of doing the big roles in the smaller houses first because you get the chance to work the kinks out. But being in small roles in the big house, you get the exposure and the experience without the pressure of the big roles. Eventually I hope to do the big roles in the big house, but at least doing the big roles elsewhere gives me the satisfaction. Kate Pinkerton is not exactly the most challenging thing to sing. BD: Have you delved into the character of Kate or do you let it be superficial? MHG: Kate is as wronged a character as Butterfly, but she’s in a different culture. She really loves this guy, and then she realizes what he’s done and she feels a great deal of sympathy for Butterfly. How does Kate know he won’t do the same thing to her? She questions his feelings about her, and I think that will be something that’s always in the back of her mind. Kate will always love the child [Trouble] because not only is it her husband’s child, but because it is this woman’s child. She realizes that Cio-Cio-San gave up a lot, and Kate has a lot of respect for Butterfly. Kate was naïve to the situation when she got into it, and when she is there in the house and she sees Butterfly, all the ramifications come to her and she realizes the position she’s in. It’s a bit like being a victim of wife-beating. She still loves the man, but she sees what has been done to her. It doesn’t work for all people, but there are women like that. Both Kate and Butterfly are like that, and they are very similar people, only they’re from two different worlds. BD: Is that why Pinkerton gravitated to the same kind of woman from both sides of the ocean? MHG: I don’t think he knew how wonderful either of them was. I think he looked at each one rather superficially. The women were not superficial; he was looking at them that way. BD: Let’s discuss some of your larger roles. What parts have you done that you really enjoy? MHG: I’ve done several performances of the Queen of the Night. BD: How’s the top F? MHG: At that time it was fine, but now it might be a different story because my voice is moving in a different direction. I’ve also sung the Countess in Marriage of Figaro. BD: When you sing the Countess, are you conscious of what has happened in the previous play? MHG: You have to be aware of what has gone before, and you have to know in the back of your mind how it ends up. That way people see you moving in the direction Beaumarchais has proscribed. BD: You don’t make eyes at Cherubino, do you, because you know that in the next play she bears his child? MHG: No, but she is flattered by the attention, and you have to have the feeling that it could evolve. BD: Is she bored with the Count? MHG: In the Marriage of Figaro she loves him a great deal. She’s matured, though, and the love is no longer the infatuation that she once had. She has seen the faults that Count has. BD: What faults does the Countess have? MHG: She is possibly a little too righteous in her life, and perhaps she has become too matronly for the Count. She hasn’t kept the honeymoon alive. She’s become the lady of the house rather than being the wife and lover that she was earlier. So the Count gets bored with her, and that’s her fault. She’s progressed into the social position and has forgotten that she’s still supposed to be interesting to her husband. BD: Would you rather play Rosina in the Barber than the Countess in Figaro? MHG: That a very difficult question. The Countess is actually more difficult to play. You have to be careful with Rosina because she can come across like a cat, but the Countess can become too maudlin, too weepy, and you don’t want that. She is still the same person. You have to be able to still see that spark which is under the surface. BD: Is it possible that Mozart developed a different side of the character and that’s why there is such a pull between them? MHG: I think so. Mozart was looking at her quite a bit later in her life when she was not nearly so naïve. You have to be careful not to make her boring because the audience has to feel sympathy toward her. The audience must realize she didn’t do the bad things on purpose. She forgives the Count at the end, and it’s a new beginning for them. BD: [Sadly] But it doesn’t last. BD: Have you sung the Rossini opera? MHG: My mezzo friends tell me they’d kill me if I did, but at this point I doubt if I’d do it anyway. It’s a very interesting role and I like the part a lot, but the decision is more musical because it really throws the ensembles off to have a soprano rather than the mezzo Rossini wrote for. I tend to lean toward the purist approach to music, and I’m not sure I’d want to do that part. BD: Do you sing any operas in translation? MHG: I have — the Countess I sang was in English. MHG: Yes... and no. It works if it’s a good translation. I don’t mean just being able to get the words across, but some translations actually change the story. Some of the things Mozart said were not really all that proper, and either the translator thinks it a little too risqué or they just won’t come to the core of what’s being said. In Così, one translation says they’ll go to the woods and have a picnic, and the libretto just doesn’t mean that at all! The librettists may not have been wonderful all the time, but that’s what they wrote and I don’t think it’s our duty to change the story to suit us. We’re stuck with the music as it’s written, so why not keep it all as one piece? BD: Which is more important — the story or the music? MHG: [Hesitates a moment] I think it has to be both. The story is important, and if you lose track of the story and go just for the music, then why bother staging it? MHG: Some of it does. If it’s a great piece it will work, but that’s because of the music, and if the audience doesn’t understand the words, they will miss the dramatic aspect. The converse is also true — you can’t have actors prancing across the stage missing notes and singing off pitch, either. BD: Does the director ask too much of the singer? MHG: Most directors that I’ve come across don’t ask enough. They are operatic directors, and there are limitations to what you can do when you’re singing. But the dramatic aspect is very important in opera. CHICAGO, May 12— Right off, you might have suspected that the Lyric Opera of Chicago's new production of ''The Mikado'' was going to be unusual. During the playing of the overture at last night's premiere, young ladies dressed as Northwest Orient stewardesses stood onstage and in the audience rhythmically miming the familiar airline drill with seat belts, oxygen masks and life vests. Suspicion deepened when the production, having landed in Japan, took us into a corporate boardroom behind which flashed signs advertising Sony, Canon, Toshiba, Fuji and that universal solvent Coca-Cola. The first number, ''If You Want to Know Who We Are,'' was sung by a chorus of executive clones, 20th-century ''gentlemen of Japan'' identically made up in black business suits, black glasses and black toupees. But no. It was the town of Titipu transported to the modern world of high-tech and low comedy. It was Gilbert and Sullivan as filtered through the churning brain of Peter Sellars, the young director who recently has been stirring things up in the theatrical and operatic worlds. He has even aroused some critics to hurl the word ''genius'' at him. Mr. Sellars, you may recall, dropped out as director of ''My One and Only'' when the producers found his ideas too bizarre. His ''Mikado'' is designed to be a 1983 model. It is full of modernizing twists and fanciful flights, many of which are good for laughs and most of which are at least good for smiles. When Ko-Ko (James Billings) recites his ''little list'' of people ''who never would be missed,'' he unfurls a seemingly endless computer printout. Yum-Yum (Michelle Harman-Gulick) sings of her own unutterable beauty while wielding a hot comb, regarding her perfect image in an electrically lighted vanity mirror and cuddling a Snoopy doll. Ko-Ko's garden is protected by one of those purple lights that zap bugs. The Mikado himself (Donald Adams) arrives in a sporty red Datsun (license plate MI-YA-SAMA) preceded by Secret Service types. None of this, no matter how clever, is likely to charm G. & S. hardliners, for whom much of the appeal of the operettas lies in their adherence to the D'Oyly Carte tradition. For them, Mr. Sellars will seem merely a misguided youth who puts the horseplay before the Carte, a trendy miscreant who deserves a punishment to fit his crime -something lingering involving boiling oil. That is probably too severe a judgment, but it must be said that Mr. Sellars did not entirely succeed with his ''Mikado,'' even on his own terms. The flashes of Lampoon humor did not compensate for the loss of G. & S. subleties in both music and characterization. Craig Smith's able conducting sometimes prevailed against Mr. Sellars's frenetic staging, but Mr. Billings went along all too willingly with the staging's parodistic tone, stressing the hard-edged, whining side of Ko-Ko so much that his gentle befuddlement could not crack through. Yum-Yum, similarly, has a heart of stone, but that is only funny if she is also implacably sweet, prim and proper. Making her a crude teenybopper was good for giggles, but once the basic joke was set out, variations became predictable. Whatever complaints might have been lodged against the evening, however, were wiped away by the appearance of Mr. Adams, that grand old Savoyard, in one of his most famous parts. His trembling delight in finding tortures to fit crimes continues to be, after more than 2,000 performances as the Mikado, a comedic tour de force. William Wildermann, too, knew what he was up to as Pooh-Bah, the ultimate bureaucrat, and Mr. Rosenshein's bright tenor and ingenuous style were right for Nanki-Poo. Dan Sullivan was an aptly pompous Pish-Tush. Diane Curry, though not sufficiently decayed to be an ideal Katisha, would have been perfectly acceptable if more of her words had come through. BD: Does opera work on television? MHG: Some does, yes. 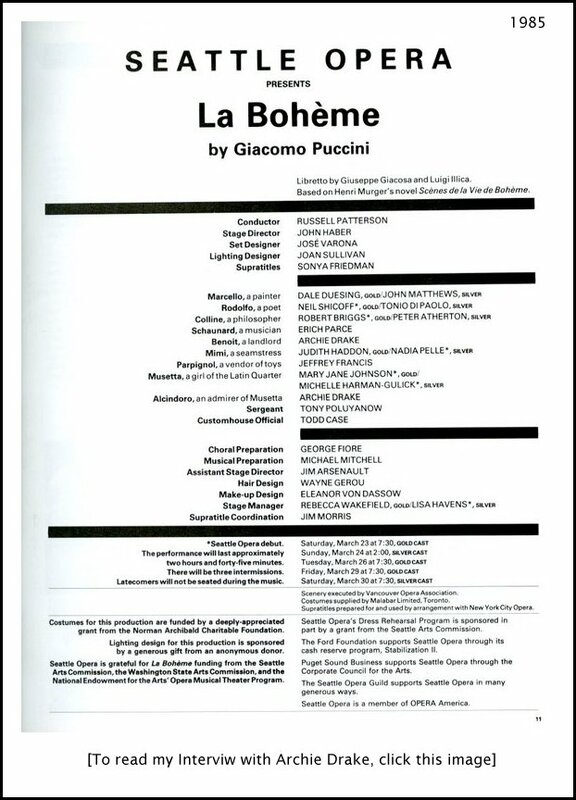 I saw the Zeffirelli Bohème on the TV and thought it worked very well, but a friend saw it at the Met and said it worked horribly in the theater. It was a television concept. The sets were so big that the characters in the theater were swamped. The Tosca which was filmed on location in Rome was great, but the dubbing was not so good. BD: Does the running translation help or hinder? MHG: I think it’s helpful for the public, and it doesn’t bother me when I watch it. BD: Do you feel that you’re part of a long continuing tradition of opera? MHG: I guess I’m not really part of the long tradition because I think the Americans have a new tradition. BD: Is it a good tradition? MHG: Yes and no. It’s good because the Americans are starting to establish themselves as singers, but it’s bad because it still has not caught on as much as it could. It will eventually because there are more young people that are interested. It’s really the responsibility of the people coming along to spread it and get propel over the idea that it’s only for the elite. BD: How do you get more people to come to the opera? MHG: You have to start with the kids. They don’t get the exposure to it that the Europeans do at a very young age. It’s not unnatural to a European child to hear singing in the operatic way. Not all Europeans love opera, but they’ve at least had the exposure and then they can make a choice. Now I’m talking about young kids because when they reach High School their tastes have been established. I originally wanted to go into musical theater. Nobody could beat Barbara Streisand. In America now, the youth have one music scene and the adults have another musical scene, so it’s divided. In Europe there is an overlap which we don’t have. Here, the only ones who seem to take an interest in classical music are the ones who study it, and usually it’s because they’re not good at sports. For me, I heard classical music all my life but never really enjoyed opera. I wanted to go into music theater, and it wasn’t until I studied voice at Virginia Commonwealth University that I started enjoying it. If the training hadn’t been for opera, I would never would have learned about it. I was studying voice to go into the theater, but I got hooked on opera. BD: Did you ever hear anything in the classical sphere that you enjoyed? MHG: I wouldn’t let myself enjoy it because I didn’t know how difficult it was. BD: But are we, the public, supposed to know how difficult it is? MHG: I don’t think the public should use that as an excuse to put up with singing that is bad, but knowing is part of what makes opera interesting because it is challenging — more challenging than music theater because it is so much more difficult for the voice. BD: But should they be conscious of the fact that what you do is more difficult than what Linda Ronstadt does? MHG: I think so. You respect someone who does open-heart surgery or brain surgery because you know how very difficult that is, so when they accomplish something, that is part of why you think it’s wonderful. The public should know how difficult it is so they can make a choice when hearing someone do it really well or just partially well. BD: Should there be a certain amount of awe? MHG: It’s not awe, but you can touch the public on different levels, and the more people appreciate the different levels, the more they can enjoy the spectacle. Anyone can come to any opera and be touched emotionally. BD: Any opera — even Lulu? MHG: Sure! That’s very emotional. It may not make you feel wonderful when you leave, but you’re being touched. BD: Might you be better audience watching a role you’ve not sung? MHG: I’m sure, but when I’m in the audience I look at many things. First, does the person look and act like the character they’re supposed to be? Are they convincing me as a character? It’s not fair to the audience to let them sit there all night confused. Then I listen to whether or not they are convincing with their voices, and only then do I ask if they are accomplishing the technical demands made by the role. BD: How can you as a performer touch people who are there for the first time, and at the same performance touch people who’ve seen the opera a hundred times? MHG: My job is to get out there and do it all. Nothing less is acceptable. We performers should first concentrate on our weaknesses, but hopefully, with all the rehearsal time and all the off-stage time we spend with the character, we should be able to give it all to the audience. Most composers write the feelings and the mood of the characters into the music, so all we have to do is to feel the music and express the music. BD: Have you sung Violetta? MHG: I’m learning the role right now, as a matter of fact. BD: Does Violetta speak to us today? MHG: I think so. She is a character whose life is really beyond her own control. There are probably lots of people who are not in the exact same situation as she is, but whose lives turn out not the way they had hoped. Then something really great happens and they feel everything will be better, and then something bursts the bubble. BD: Why are you learning this role — is it something you should have in your repertoire or have you been asked for it specifically? MHG: Both. I’m going to be singing it soon, but it’s a role I want to know. BD: Do you work here in your apartment? MHG: Sometimes, when nobody else in the building is sleeping, but I also work at the Opera House. They don’t seem to mind the singing and the piano, but it’s the warming-up that my neighbors object to. Warming up is something that most people just don’t understand. We have to stretch the voice beyond our range in order to be able to sing the notes within the range. One time we were performing for a group of children and we combined our vocal warm-up with physical exercises. Most of the kids got the connection and really understood why we made those strange sounds. They can deal with the fact that an athlete has to exercise, but not with the fact that a singer has to exercise. BD: Do you feel you are an athlete? MHG: Yes. We are specialized athletes. BD: How do you decide with roles you will sing and which ones you will not sing? MHG: It’s very difficult. When you have a really light voice you have no choice, or at least not as big a choice because there are only a few roles you will be asked to sing. It’s the same with a really dramatic voice, but those voices in the middle have more problems. You have to look and see which direction the voice is going — either lighter or heavier. Some people hear only the darker colors in the voice and ask for heavier roles. Other people hear only the coloratura and push you into those roles. So I choose roles that suit my voice and look like they will be what my voice will be capable of in the near future. I sing lots of Mozart and a few Verdi roles, and the French repertoire is good for me right now. BD: So you choose roles that fit your voice. Do you like the characters, or would you rather sing a different character if you could? MHG: I’m pretty lucky. I’d be pretty unhappy if I was a light coloratura. There are some wonderful parts, but I’d get tired of them very quickly. A lot of the characters are not very complex, so they’re not as interesting in that respect. I think Violetta is a complex character and I enjoy that. The Verdi roles feel really nice in my voice, so that’s why I’m trying to lean that way. Verdi wrote wonderfully for the voice. The lines are usually even, and the breathing is consistent. Mozart is wonderful too, but some of the lines are long while others are very short. Not that Verdi is not difficult, but something about the way he phrases the line puts it well in the voice. Heavier voices do prefer Puccini. Tosca has lines that are longer and even more drawn out. Maybe one day I’ll sing Puccini, but not right now. I enjoy most music I’ve sung and listened to. I’d never heard anything of Strauss until I came here, and now I enjoy that, too. BD: Will you sing Sophie? MHG: I sang a bit of it at Grant Park, but it lies funny in my voice, and personality-wise it just doesn’t interest me. The Marschallin interests me much more because, again, she’s more complex. BD: Do love scenes on stage bother you? MHG: Love scenes are wonderful when they’re done right. Unfortunately, you don’t always get someone who can handle that onstage. Again, I’ve got to be convincing. Even if you detest the person, you’ve got to convince the audience that you’re in love with him. BD: Is it easier to do when your husband is not there? BD: How much do you actually become the character? MHG: If it’s a character that I relate to or one who has some traits of my own, I become very much that character. If it’s someone I don’t relate to as much, I have to consciously make an effort to do certain things. With time, those things become natural, but if I don’t think I have anything to offer the character, I probably should not do it. I’d try it, but if after a few times through it I don’t feel comfortable, I’d put it away at least for a while. BD: So you see yourself growing into some parts? MHG: Sure, and there are probably some roles I’ll just never be right for. An artist should bring something to a role that the audience is going to want to see, and it should be a role that the artist feels good about, too. BD: Do you enjoy the business of opera? MHG: No. I don’t. I’m getting a lot of advice right now and I’m being very careful which bits of advice I accept. I guess it’s like any other business — not very individually oriented, and not always artistically oriented. I really don’t like all the games. I want people to be honest with me and to tell me what they think and why. BD: It is too cutthroat? MHG: At times it’s too unnecessarily cutthroat. The same things could be accomplished if the people were straightforward and honest about what they were doing. Maybe I’m idealistic in that respect, but it seems like those who get the farthest are the ones who are willing to play the game. I’m not saying they’re willing to or enjoy it, but even when you don’t want to play it you’re forced into it. In my particular position right now, saying no at the wrong time could seal my doom. BD: Where do you hope to be ten yours from now? MHG: I hope to be able to sing certain roles with certain conductors and certain singers and certain stage-directors. But whether that happens, I don’t really care. It would be great to say I’m singing at the Met or La Scala, but I would rather simply present the roles I love with people who believe in what they’re doing, and hopefully that will reach people. My idea of success is to reach those goals. This conversation was recorded at her apartment in Chicago on November 27, 1982. 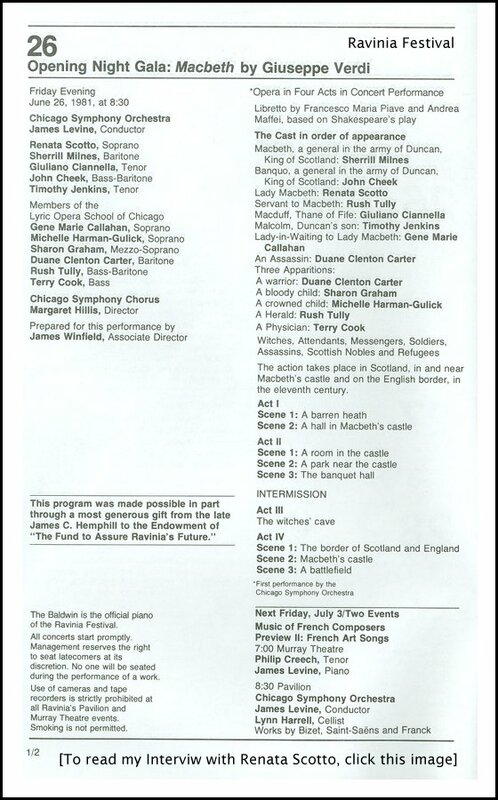 A transcription was made and published in Opera Scene in May of 1983. The transcript was slightly re-edited and posted on this website in 2016.